Please tell us about the SMART Wind Consortium and what led to the preparation of this report. In mid-2013, a member of the Distributed Wind Energy Association saw a request for proposals from the U.S. Department of Commerce that seemed like a perfect fit for the relatively new organization to help American wind turbine manufacturers maintain global competitiveness and leadership. The program’s focus was to support industry-driven consortia and roadmaps addressing research challenges that are impeding the growth of advanced manufacturing in the United States. NIST awarded DWEA’s team, supported by eFormative Options and Wind Advisors Team, a 2-year grant to build the Sustainable Manufacturing, Advanced Research & Technology (SMART) Wind Consortium and develop a shared-vision Roadmap to guide action steps for the U.S. distributed wind industry. Through the consensus-based roadmapping process, the SMART Wind Consortium has linked together more than 2 dozen distributed wind energy equipment manufacturers – including 21 U.S. firms headquartered and manufacturing in the U.S. – 50 other vendors and industry supply chain members, researchers from 4 federal laboratories, 30 academic stakeholders, and nearly 20 nonprofit organizations, government representatives and other stakeholders. One of the first steps in forming the SMART Wind Consortium involved identifying U.S. Original Equipment Manufacturers (OEMs) currently producing distributed wind turbines, startups seeking to manufacture distributed wind turbines and components, and universities and laboratory researchers with the latest technology innovation and manufacturing approaches. What are the major challenges the SMART Wind Roadmap addresses? The current major challenge for U.S. manufacturers is how to substantially drive down costs while maintaining quality within a micro-capitalized industry and a shifting market. Global competitors are developing new wind turbine technology, putting pressure on U.S. distributed wind manufacturers and markets in other countries such as Italy and the U.K. where they have experienced major growth. So the U.S. distributed wind turbine industry is poised for rapid growth, both with exports and domestic installations, but it also faces competition from imports. What are the key take-aways and recommendations? Sustaining the Consortium and partnerships to understand costs and benefits of top priority R&D, connecting suppliers and industry members, and creating industry-wide databases to help guide R&D funding and workforce development. These prioritized action steps will help reach the DWEA “30 GW by 2030” vision, aiding distributed wind industry growth and advancing innovative manufacturing techniques by increasing production volumes and reducing lifecycle costs while maintaining high quality. These actions will result in more competitive systems and greater market share for U.S. manufacturers and accelerate deployment of U.S. technology, helping to generate clean, renewable energy, increase employment in the sector, and bolster the capabilities of this U.S. industry. How has the SMART Wind Consortium gotten competing OEMs, academics and other broad stakeholders to work together to achieve common goals? We organized SMART Wind Consortium participants into four Subgroups based on common manufacturing techniques: Mechanical Systems, Support Structures, Electrical Subsystems, and Composites. Industry, laboratory researchers, and academic experts served as SMART Wind Consortium Subgroup leaders who helped to guide and facilitate discussion and collaboration. Consortium participants signed up for one or more Subgroups and volunteered to participate in both face-to-face and virtual meetings with detailed technical dialogue, which were used as a basis for brainstorming actions needed. The main goals of the meetings were to begin the development of the Consortium as an industry group and to identify possible cost-reducing actions that can lead to evolutionary product and manufacturing improvements. The SMART Wind Consortium hosted seven face-to-face meetings from October 2014 to February 2016: a Launch meeting, four Subgroup meetings, a Manufacturing Forum, and a final Roadmap Review meeting. The SMART Wind Core Team convened a steering group of the 14 most active North American manufacturers of distributed wind turbines and components to ensure that project objectives aligned with their specific company needs. This group had never worked together before, and Consortium discussions and gatherings helped convince historical competitors to collaborate and consider cooperatively investing in critical actions to support each other’s’ perspectives. Going forward, a challenge will be keeping this group working together effectively with continued dialogue to address shared goals. What are DWEA’s targets for cost reduction and job growth? Distributed wind’s future lies in areas with grid parity in large enough markets to allow the industry to grow and thrive. State and federal subsidies are a bridge to that future by enabling the industry to reach volumes and apply advanced manufacturing techniques that reduce the total project costs. The SMART Wind Roadmap shows how to create that bridge and make distributed wind a significant long-term contributor to America’s clean energy future. 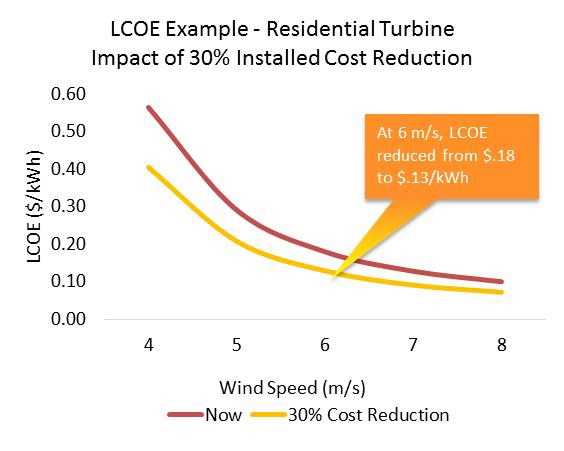 Substantially reducing the levelized cost of energy (LCOE) for installed small residential wind turbines in the near-term by 30% is shown in the figure below. This degree of cost reduction is needed to achieve parity with U.S. retail electricity grid rates in key markets. DWEA estimates that the entire U.S. small, mid-size, and utility-scale distributed wind industry employed a 5,500-strong full-time equivalent workforce in 2012, averaging 30 jobs per MW sold and $410 million in annual investment. Distributed wind industry jobs include local installers, a domestic sales force, engineering/technical teams, and manufacturing jobs. 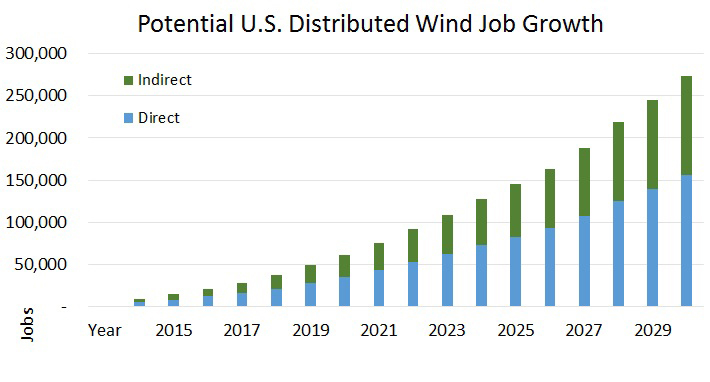 Considering direct and indirect jobs in the U.S. distributed wind sector, a 50-fold increase to more than 250,000 workers is envisioned to meet DWEA’s 2030 vision, as shown below. Where are the best opportunities for driving down costs and building both domestic and export markets? A review of aggregated breakdowns of top-level bills of materials (BOMs) from eight leading U.S. wind turbine manufacturers revealed that towers are the single highest cost element for both micro/residential and commercial/mid-size distributed wind sectors, and foundations also represent significant cost. The highest priority Roadmap actions focus on both support structures and electrical subsystems, because inverters (for the micro/residential sector), the control panel (for the commercial sector), and generator/alternators are also major cost contributors. For mechanical subsystems, the gearbox and bedplate are the most expensive, particularly for larger turbines. Blades are the dominant focus for composites. Soft costs not included in BOMs such as installation, turbine assembly, site development and preparation, zoning and permitting, transportation and logistics, and other non-hardware costs also provide important opportunities for savings as they often contribute substantially to overall system costs. How can wind turbines and towers be designed to make O&M easier? SMART Wind participants identified several ways to ease wind turbine and tower installation, maintenance, and safety, such as identifying parts that require frequent replacements and planning for serviceability with components/modules that are easily removed and replaced. Other strategies include enabling time-efficient work platforms, increasing tie-off and anchor points for better grip, ensuring adequate spacing of climbing pegs, developing an interactive monitoring system, and improving ladder systems and safety approaches. Time-motion studies can be conducted to find additional ways to safely reduce time and labor for distributed wind turbine installations, and the utility-scale wind industry may be able to offer lessons from designing, installing, and maintaining meteorological towers. Ongoing training opportunities are needed for small wind installers to erect, maintain, and operate distributed wind turbines, especially for installers who climb non-tilting towers. What do you mean by the term “Advanced Manufacturing”? Recognizing that low-volume manufacturing is challenging, U.S. manufacturers have expressed interest in improving castings, reducing labor and part costs, being flexible in manufacturing, and evolving designs to be more efficiently manufactured. Collaboration within the diverse SMART Wind Consortium has encouraged suppliers and installers to learn about, adopt and implement lean principles, lean systems thinking, innovation engineering, and other cutting-edge concepts to improve manufacturing processes. Examples include near-net castings and additive manufacturing (3D printing of parts), and automation for low-volume manufacturing. What skillsets are most needed for the distributed wind advanced manufacturing workforce? U.S. manufacturers of distributed wind turbines and key components are typically small enterprises, and thus resource-constrained financially with available staff lacking all needed skillsets. Many of the skills used to manufacture, assemble, install and maintain distributed wind turbines are similar to skills required in the oil and gas industry, such as welding. Recent increases in domestic oil and gas development have increased labor and employee turnover rates in the distributed wind industry. Processes identified as “expensive” include manual welding, assembly, controls assembly, application of non-corrosive finishes, and labor for permitting. Looking forward, Lean Manufacturing, innovation engineering, continuous improvement and other advanced concepts examined by SMART Wind Consortium participants can be deployed to increase the competitiveness of U.S. distributed wind equipment manufacturers. Implementing the Roadmap’s strategy for the U.S. distributed wind industry’s continued growth will increase manufacturing process improvements incrementally while addressing shifting production levels, taking individual steps that will reduce manufacturing costs but not become an undue financial burden. Applying the action steps identified by the SMART Wind Consortium will lead to more competitive systems and greater market share for U.S. manufacturers. This will accelerate deployment of U.S. technology, increase employment in the sector, and bolster the capabilities of this American-led industry to multiply its generation of clean renewable energy worldwide. Heather Rhoads-Weaver is Founder and Principal Consultant of eFormative Options LLC, specializing in advancing sustainable energy solutions, creating funding and resource plans, and strengthening relationships with stakeholders, drawing on substantial experience and lessons learned with managing complex data and successful consensus-building efforts.